Use the map menu below to display interactive maps of the World, in a frame on this page or in full-screen mode. Africa, the second largest continent, occupies about 11,667,239 square miles (30,244,049 square kilometers). Africa lies in both the Northern and Southern hemispheres, with the greater part north of the Equator. In 2007, Africa's population was approximately 939,166,800. Antarctica is a continent that lies around the South Pole. Antarctica occupies about 5,500,000 square miles (14,200,000 square kilometers) and has no permanent residents. Asia, the largest continent, occupies about 17,139,445 square miles (44,391,162 square kilometers). Asia lies primarily in the Northern hemisphere. In 2007, Asia's population was approximately 3,976,028,000. Australia, the smallest continent, occupies about 2,967,909 square miles (7,686,884 square kilometers). Australia lies in the Southern hemisphere and is part of the Oceania region. In 2007, Australia's population was approximately 20,857,000. Europe, the second smallest continent, occupies about 3,997,929 square miles (10,354,636 square kilometers). Europe lies in the Northern hemisphere. In 2007, Europe's population was approximately 732,578,400. North America, the third largest continent, occupies about 9,361,791 square miles (24,247,039 square kilometers). North America lies in the Northern hemisphere. In 2007, North America's population was approximately 523,775,400. South America, the fourth largest continent, occupies about 6,880,706 square miles (17,821,029 square kilometers). South America lies primarily in the Southern Hemisphere. In 2007, South America's population was approximately 376,055,500. 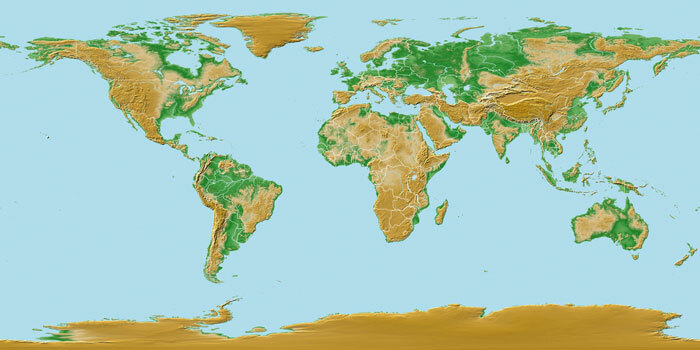 Visit the World Factbook and World Atlas sites for more maps and info about the world and its continents.